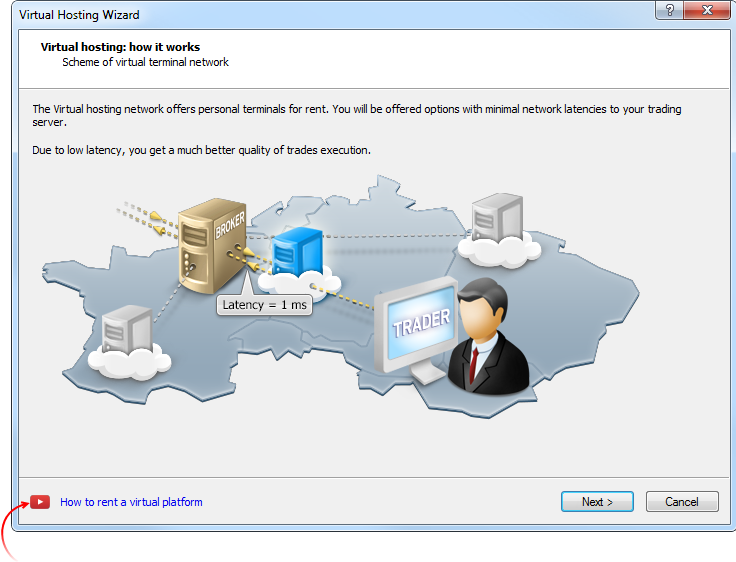 Added a link to the tutorial video "How to Rent A Virtual Platform" into the Virtual Hosting Wizard dialog. Watch this two-minute video to learn how to easily launch a trading robot or copy signals 24/7. This video as well as many others is available on the official MetaQuotes Software Corp. YouTube channel. Fixed migration for hosting when a custom indicator is called or an EX5 library within a custom indicator is called from an Expert Advisor. Accelerated update of the list of open orders and positions during high-frequency trading (50 and more operations per second). Optimized and greatly accelerated initial synchronization of the terminal with a trade server in case of a large amount of symbols (tens of thousands). Now, you can start working much faster after connection is established. Optimized and significantly reduced memory consumption by the terminal. Added saving and restoring the depth of market settings when closing/opening the terminal. Fixed artifacts that occurred in Windows 10 when dragging the terminal windows. Fixed the context help for a number of commands and dialogs. For activating help concerning a certain element, move the cursor on it and press F1. The works on adapting the interface for high resolution screens (4K) are underway. ORDER_EXTERNAL_ID - order ID in an external trading system (on the exchange). DEAL_EXTERNAL_ID - deal ID in an external trading system. Fixed the ZeroMemory function operation when working with structures and classes. Memory clearing was not performed in some cases. Added the error codes during the SendFTP function operation. The function sends the file to the address specified on the FTP tab of the Options window. Fixed type casting access by inheritance between child class objects and their parents. Fixed a few errors in the class templates. Fixed requesting ticks using the CopyTicks function. When specifying the COPY_TICKS_TRADE parameter (copy only trade ticks) for consecutive identical trade ticks (identical volume and last price), only the first tick was passed. Fixed defining a size of a custom type variable. Fixed an error when using ZLib in the CryptDecode function that led to an infinite unzip loop. Fixed synchronization of the price history for a symbol different from the main test one. Fixed doubling of the TRADE_TRANSACTION_DEAL_ADD transaction (adding a trade to history) in the OnTradeTransaction event handler. Changed forward test behavior during genetic optimization. Now, all unique results obtained after genetic optimization participate in forward passes. Previously, only 1/4 of the results were used. 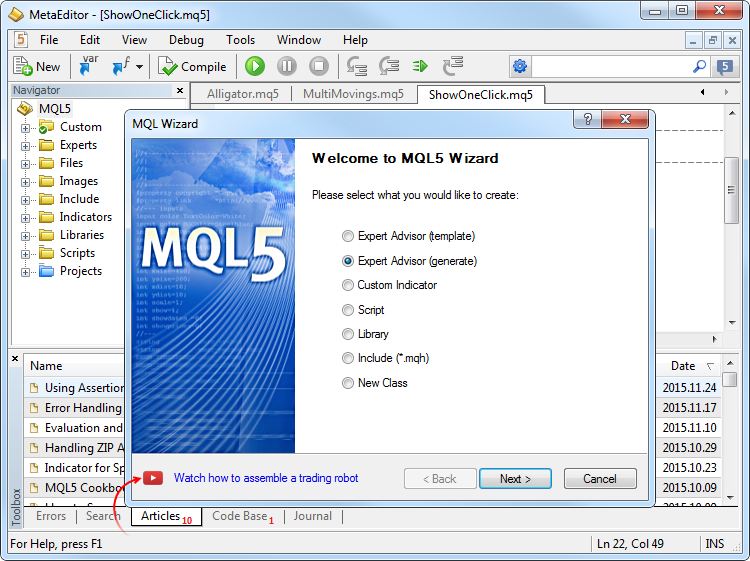 MetaEditor: Added a link to the tutorial video "How to Create a Trading Robot in the MQL5 Wizard" to the MQL5 Wizard. Watch this three-minute video and develop a trading robot without writing a single line of code. Fixed window arrangement commands if one of the windows is fully expanded. The Window menu allows you to arrange open files as tiles, vertically, horizontally and as a cascade.